You’ve created a vision for a work of art that you want, or you've found an artist that fits perfect with your style. So, how do you go about asking them to create a piece specifically for you? 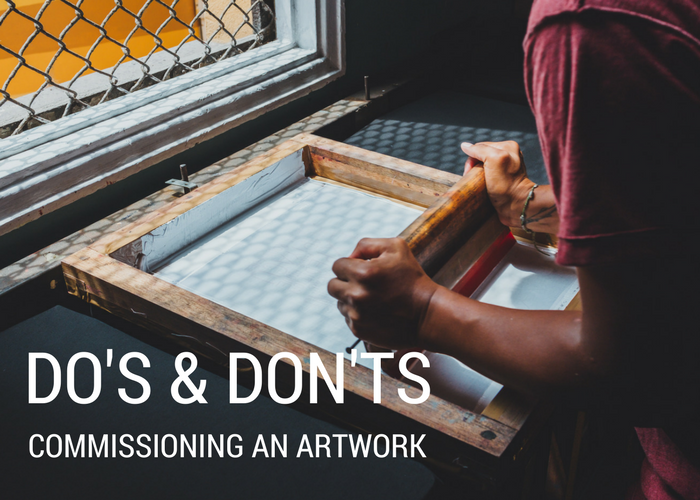 If you are considering commissioning a piece for the first time, it can be intimidating. But, it can also be a fun and collaborative experience! Follow these do’s and don'ts, so you can walk away happy with your custom piece and support an artist you appreciate. DO take care of important details in the initial contact. Reach out to the artist to see if they are taking commissions and will accept the type of work you would like done. Many artists can be contacted by email or a gallery can help make the connection for you. You never get a second chance to make a first impression. So, make the initial contact a pleasant one. Let the artist know why specifically you would like them to make the piece. What is it about their work that intrigued you? Prepare yourself to answer these questions artists might be ready to ask you when considering accepting your project. DON’T assume that every artist will want to accept your request. And don't wait until the work has started to discuss important details. There are many reasons an artist may turn down an offer. Some artists have had awful experiences with commissions in the past, are currently working on other projects, or they may feel they are not a good fit for your project. It may put an artist's mind at ease if you ask about the medium's they can use, price and timeline upfront. DO provide the artist with as many details about the piece you want as possible. They will need to know what materials will be needed to produce the piece you want. Providing reference images is a great way to communicate with them about what you are looking for. If the piece will be for a certain area of your home, provide the artist with an idea of the style so they can understand how this piece with fits with your aesthetic. DON’T be vague about what you want or expect the artist to know exactly what you will like. If the artist accepts to work on the proposed piece without a clear idea of what you want, there is a good chance you might not be happy with the end result. DO expect a contract. Or, be prepared to make one. You should have a contract in place between you and the artist before work begins. The contract should include the price, with all applicable expenses associated with creating the piece, and payment terms. Many artists will also ask for fifty-percent up front or some sort of deposit. The contract should also include a timeline detailing when certain aspects of the work will be completed so that you know when to check in with them. The timeline should also include the date of completion and approval process. The contract will also be the place to include what rights you and the artist have for using the work. Think & Wonder Ink provides a great example of what the contract between you and an artist would look like. DON’T assume that terms, price, and timelines will work themselves out or develop along the way. A formal contract keeps the process of commissioning an artwork as professional as possible by setting clear expectations for the project. DO communicate and have fun while working on a commissioned piece. Keep in touch with the artist to make sure the project is staying within the timeline. Also, see if they need anything from you. Do they need more reference images or materials? By communicating clearly any concerns or questions to the artist you can both put doubts aside and be excited about the project. DON’T lose contact with the artist. Do not wait until the piece is close to being finished before you check in. If the artist is on the wrong track, big revisions could be expensive, timely, and compromise your relationship with the artist. Most artists will expect you to be reaching out and communicating pretty often — it should be part of the process. Everyone appreciates recognition and praise for their work. Commissioning a work of art can be great for both collectors and artists, if it is done right. As a collector, it is your chance to be a part of the creative process and bring to life something that you will connect with forever. For artists, it's a chance to build lasting relationships with collectors and stretch their creative boundaries. Not sure where to search for artists who might commission pieces you like? Artwork Archive’s Discovery pages are a great way to find artists who would love to hear from you. The short answer: No. Here's how to build an impressive art collection without all the cash.